Geckos are a large family of mostly smaller lizards. They live in warmer countries around the globe, particularly in the tropes. About 1,500 species of geckos exist, the largest of them grow up to around 40cm, as the tokay gecko. All the geckos have in common the peculiar ability to climb up walls and windows and can even walk along ceilings in a considerable speed. They are mostly nocturnal and feed from insects as mosquitoes, flies, ants and take advantage of electric light in and around buildings where insects are attracted to. The characteristic sound, where the geckos have their name from, comes clearly from the tokay gecko. In countries like Thailand, Laos and Cambodia one can hear the 'ge-koh - ge-koh - ge-koh' often several times a day in rural surroundings. In many places where I personally stayed while travelling Southeast Asia a tokay gecko lived and came out at dusk. The smaller, more common geckos who appear in a larger number utter another noise. It's rather a quiet, chirping sound. Another peculiarity is that the geckos do not have eyelids. They clean their eyes sometimes with their tongue, what moistens them as well. When being under attack the geckos can detach their tail. The tail then is still waggling hectically for a while, still showing the stress the animal was under, and maybe distracting the attacking predator from the main body. Cats love to catch geckos and to eat them. I know a cat which caught a tokay gecko and ate him - only the tail was left. Other potential enemies for the geckos are birds, snakes and other, bigger lizards and rats. Lizards in general have many teeth. Geckos for example have some 100 teeth, and they fall out and get replaced every three to four months. That reminds to their 'big brother', the crocodile. Many kinds of geckos are bright and colourful, but the most common geckos in Southeast Asia are not - they are pale and inconspicious. 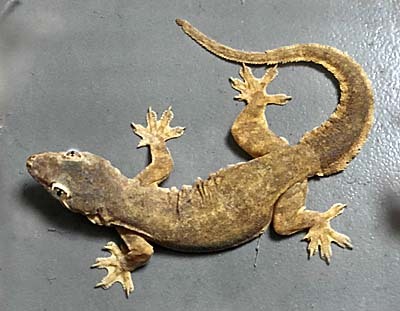 The most remarkable feature of the geckos is their capability to walk up on smooth, vertical surfaces as walls, glass and mirrors and even walk along ceilings. How can they trick out gravitation? It took decades until scientists found out what's behind it. Basically it's explainable by attracting forces on molecular level, here in particular the 'van der Waals' forces. It's a kind of gravitation, but a very weak one. Additionally the geckos feet are equipped with glands who spend a certain secret which supports the van der Waals' forces. 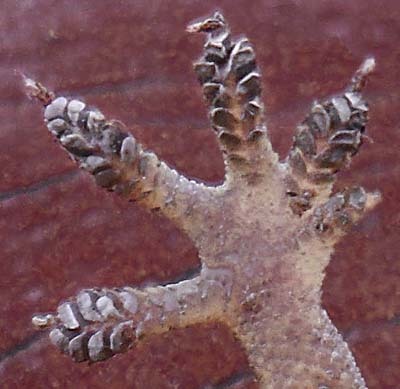 In case the gecko want's to get loose from a surface it's toes have the ability to bend upwards - the opposite direction as human fingers can bend. So they mechanically unstick from the surface. The adhesion ability does not work on all surfaces. Geckos who fall into a stainless steel sink are helplessly caught in there. The same thing happened with a gecko who fell into a pepper bowl made of a certain kind of stone. That's maybe explainable with the surface of the bowl's stone - it's a rough, porous one. It could also be that the grinded pepper in there stick at his feet and disturbed the adhesion. However, he couldn't leave the trap. Also teflon surfaces don't support the geckos peculiar climbing abilities. In generally, though, despite the 'sticky' attribute of the gecko's feet, the feet are 'self-cleaning', repelling particles of 'dirt' as dust etc. Native in Southeast Asia is the common house gecko (Hemidactylus frenatus), which appears in almost any home and building. They show all the traits of geckos in general as described above and reach a size of 7cm to 15cm, tail included. By ships the house gecko spread out around the globe's tropical and subtropical countries. Due to their adaptability they are a threat for endemic species in other countries. They compete succesfully with other gecko species for food and manage to drive them out of houses. They are also known for transfering mite-based diseases to other geckos. There are also reports that the common house gecko can cause damage to electrical devices. The only apparently observable disadvantage of geckos are the excrements who are dropped everywhere in the houses. Another species is pretty similar to the house gecko: it's the Indo-Pacific gecko (Hemidactylus garnotii). It is also endemic and widespread in Southeast Asia. 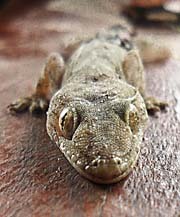 It's colour, a brown-grey pattern, is a bit darker than that of the house gecko, and it's snout more pointed. Just to mention that, these geckos are completely harmless for humans and are not venomous. They are shy and try to escape human approaches, but when touched with the hand they get only scared. Bigger ones might bite in an attempt of self-defence, but the bite is not even scratching the skin.